Hello Lovely Ladies and Bellas! 2017 is coming to a close end. This year, I was able to try decorating my weekly planner spreads more. It was fun even though it took some time before I was able to actually jot down my activities and plans for the week. 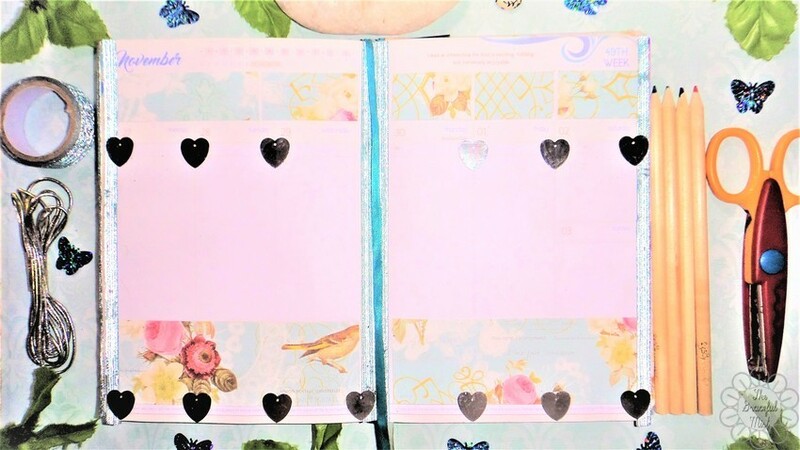 I also made a post, "My 5 Planning Tools for Daily, Weekly and Monthly Planner Spreads" about the top planning tools or materials I often use whenever I decorate or plan my weekly planner spreads. You may read it for more details as I included in that post the majority of the things I used in the weekly planner spreads below. 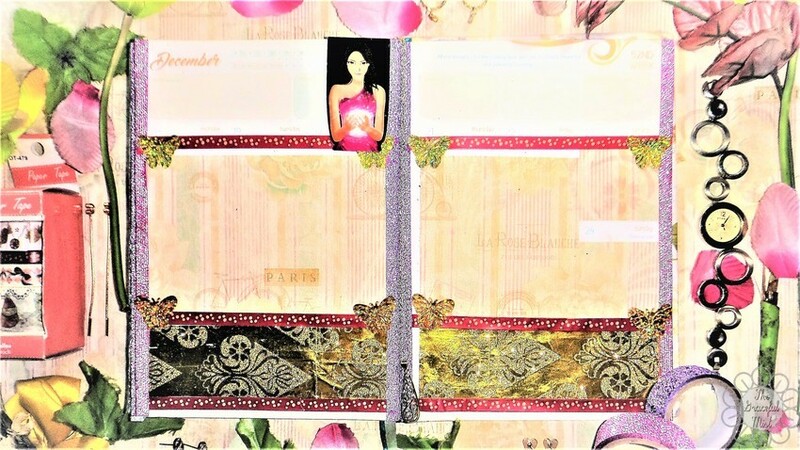 As far as I can accurately remember, I didn`t spend any money in designing my planner spreads since I`ve had so many leftover art and decorative materials since I was in elementary. I simply used available items I had at home. The "Pink Floral" is inspired by Valentine`s Day. The theme is mostly composed of pink, red and silver colors, hearts, and floral designs. 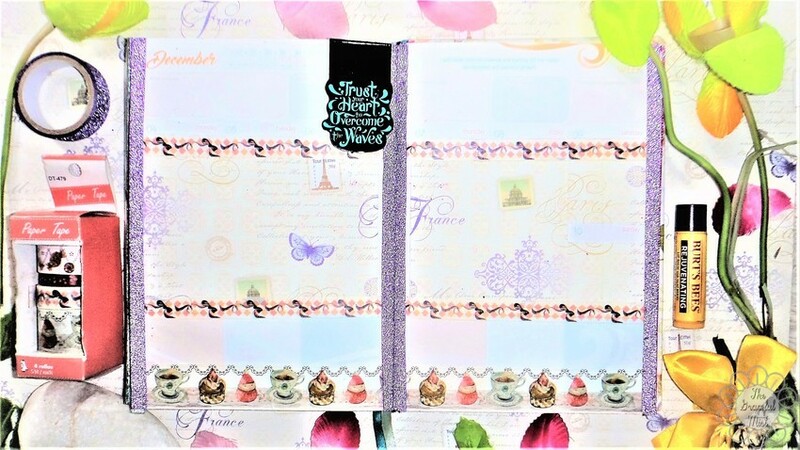 This is one of my top favorite planner spreads in this list because it`s very soft, light and feminine. It`s a very beautiful design that`s great not only for February but also for all the other months throughout the year. It`s an excellent design especially for females who adore pink and feminine designs greatly. "Vibrant and Vivid" was still inspired by Valentine`s Day but it`s bolder with the red borders and more colorful designs. In the final spread which I wasn`t able to show here, I actually decked all days with tiny colorful stickers which made the spread more vibrant. This weekly planner spread is great for February and right before fall season. This weekly planner spread is full of light designs which represented my bright, calm, feminine and gentle aura that week. As usual, I put sky blue glitter tape vertically on the left, middle and right areas to give the spread some slight glitz and glitter. I designed it by pasting floral prints and decorative silver hearts on the top and bottom areas of the spread. "Royalty in Blue" is very similar to "Floral Love in Blues." 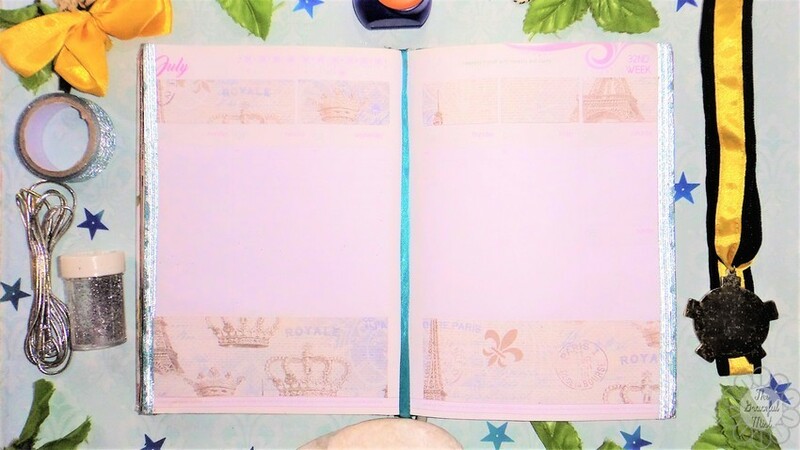 However, I used a decorative paper with royal and Eiffel Tower designs for the top and bottom areas of the spread. It`s quite elegant and simple yet still artsy and well-decorated. "Sweet Pink Floral" is quite similar to my other pink-related weekly planner spreads because I used a pink floral print that I also used with "February 2017 | Pink Floral". However to make this spread a little more festive for December, I added some washi tapes with a design that has many candies. The candies remind me of the sweets people would give to young kids caroling, or the chocolates and candies people would throw on the floor for both kids and adults to pick up and get as much as they want during Christmas or New Year parties. This weekly planner spread is so cute with the bubblegum pink color and light designs. 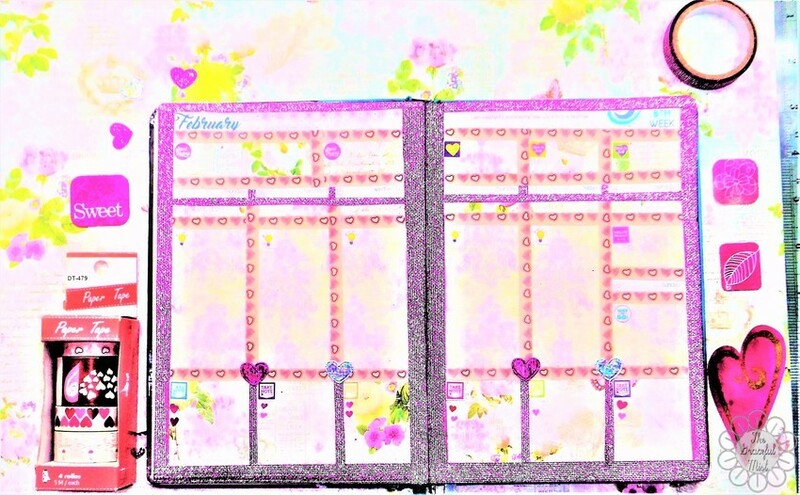 It`s a beautiful weekly planner spread design you can use throughout the year. 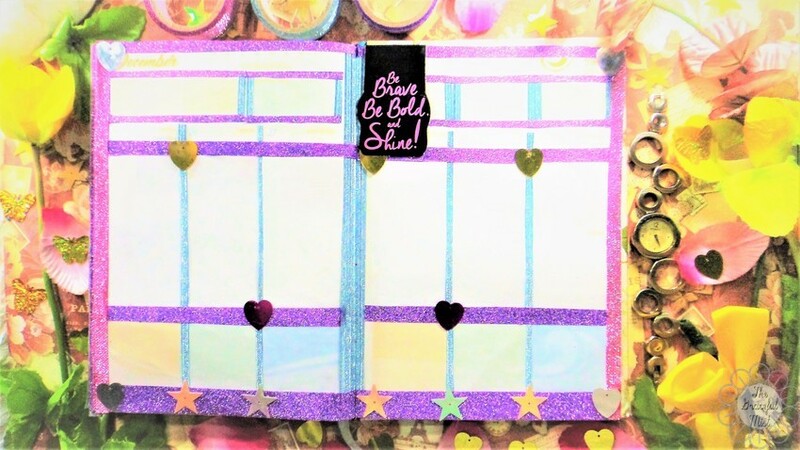 For this planner spread, the main color scheme is violet and yellow. This weekly planner spread was on the first week of December, the start of cold season, holidays, and celebrations which is why I added a sprinkle of decorative items which are related to that. Like the usual, I put violet glitter tapes vertically on the left, middle and right sides. The background print I used has a very light yellow/gold background print with gray cursive writings, and purple designs. I also added some washi tapes on the top and bottom parts of the pasted decorative print. Lastly, I put a wider washi tape with cups of tea, cupcakes and snowmen design at the bottom of the spread. The "Golden Days" weekly planner spread was inspired by the upcoming Christmas eve, Christmas day, and New Year. These days before the actual holidays are very important to me because these are usually the times wherein there are Christmas parties, get-togethers, and other reunions which will give me memories to treasure. 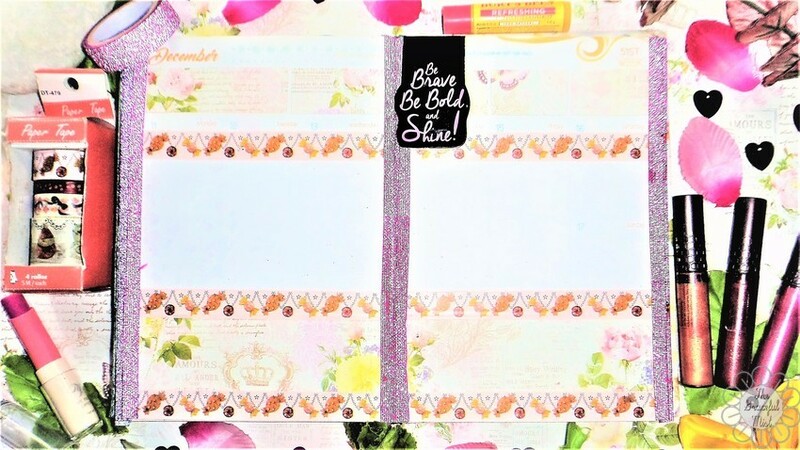 The bottom part of the planner spread has gold background paper with some intricate and glittery designs. I chose to put this as my background because I plan to put a summary of my plans, dreams and goals, at the same time, photos of my holiday vacation. I named it "Golden Days" because it`s the significant week I ought to be preparing for the holidays and for 2018. This week, December 18-24, is my opportunity to help make my vacation days, and 2018 less stressful, more abundant, and perfect. "Sparkling New Year" was simply decked with glittery borders, and hearts and stars decorative crafts. I wanted the week of Christmas and New Year to be bright and bold by using the colors I often use in my planner spreads. I really like pink, violet and blue so I chose these glitter tapes for the borders. I wanted my weekly spread to represent how I want the last week of December to be and how I want 2018 to be; young, bright and full of dreams. I wanted it to be colorful because I want my 2018 to be colorful with exciting and amazing activities that will help me in turning my dreams to reality. Most of these weekly planner spreads can be used as an idea or inspiration for all months of the year depending on how you want to customize the designs. Most of these were also decked with glitter and washi tapes, beautiful background papers, and cute accessories and decorative items. P.S. Get 20% off of the regular price of any* product at ILoveBDJ.com if you use this coupon code: "bella_kathryn"
Which weekly planner spread in this list do you like the most? Would you like to see more weekly planner spreads ideas and inspirations or would you like to see some monthly planner spreads as well? You may share your thoughts in the comments section below. 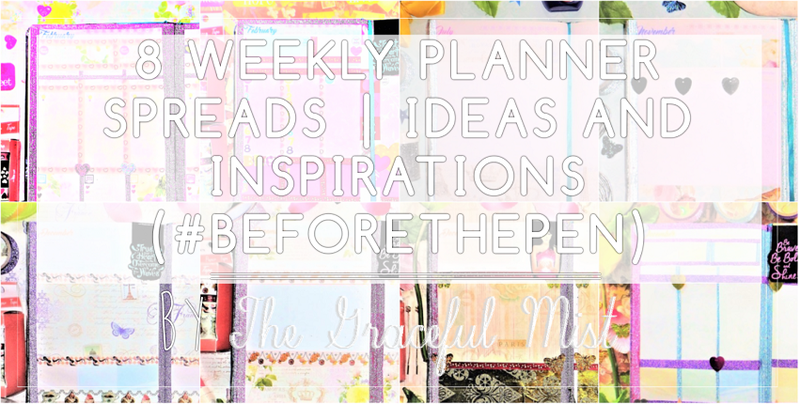 For planner spreads updates, you may follow @TheGracefulMist on Facebook and Twitter, and @TheGracefulMistBlog on Instagram. Disclaimer: This is not a paid or sponsored post. All opinions in this blog post were written with utmost sincerity and honesty. *Any product allowable by Viviamo Inc. to have 20% off using the code, "bella_kathryn". There may be products not allowed to have 20% off using the said code.